The weeklong Kessler-Eidson Trial Techniques Program will educate 283 students beginning May 2. 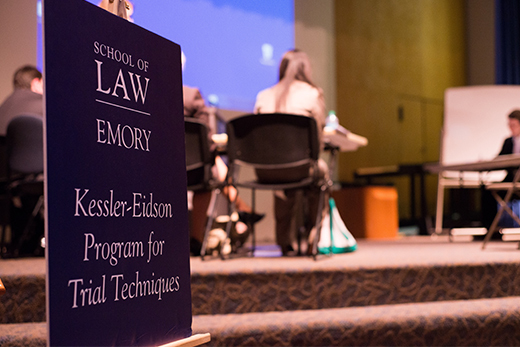 A delegation of law professors from URAL State University in Yekaterinburg, Russia, will attend Emory Law's spring session of the Kessler-Eidson Trial Techniques program, a learn-by-doing program required of all second-year law students. The Russian lawyers are sponsored by the U.S. Russia Foundation for Economic Advancement and the Rule of Law in an effort to introduce experiential learning to Russian law schools. Their visit follows multiple visits by Emory faculty to Russia to facilitate this training. The partnership is led by Emory Law professor Paul Zwier, director of the Kessler-Eidson program, with participation from Robert Ahdieh, vice dean and K.H. Gyr Professor of Private International Law; and adjunct professors and attorneys Matt McCoyd; Alexander Barney; and Brad Kessler. The weeklong intensive will educate 283 students beginning May 2 and is modeled after the National Institute for Trial Advocacy's program for teaching practicing lawyers. Emory Law's program is the largest in the country and is recognized as one of the nation's finest. The American College of Trial Lawyers has twice conferred on Emory's program the Emil Gumpert Award for excellence in the teaching of trial advocacy. The program's teaching methodology focuses on integrating the second-year law student's knowledge of substantive evidence with practical trial skills through a "learn-by-doing" format. Students develop theories for particular witness examinations, decide on appropriate approaches to bring out the facts consistent with their theories, prepare witnesses and conduct direct and cross-examinations using current courtroom technology in the use of exhibits. Skilled lawyers from across the country will converge upon Emory to team teach the students. One of those is Reuben Guttman, senior fellow in the Center For Advocacy and lawyer with Guttman Buschner in Washington, DC. He will serve as one of ten leaders when the group is divided into teams. Guttman expressed the value he sees in the program. "In the real world, the practice of law requires fact investigation first before the law is applied. The Kessler-Edison Program requires students to drill down on the facts first, organize them, and fit them into a legal theory in order to present a case to a judge or jury. No law school in the nation - other than Emory - requires this as a condition of graduation." The students use two mock case files during the program. They have been working with the first case file over the spring semester and will conduct a bench trial with that case file on May 5. On May 6, the students will begin working with a second case file. The program culminates with a "jury" trial on Friday, May 8. The law school has recruited jurors from Grady and Druid Hills high schools, so every Emory Law second-year student will get the opportunity to try a case and observe jury deliberations – something practicing attorneys never get to do. The Kessler-Eidson Program was founded in 1982. "The program has lasted because the need for these skills remains as important as ever, and because the confidence that the student gains from the program serves them in such great stead once they go out into practice," says director Zwier. "The proof is in the able and loyal faculty that return each year to pass on to the next generation of lawyers the skills they will need to be effective for their clients."